By under-taking the installation of this door, the installer understands the dangers associated with the installation. 1st United Door Technologies is not responsible for any and all liability resulting in the injury and/or death derived from an improper installation. READ ALL SAFETY AND CAUTION STICKERS BEFORE INSTALLING DOOR. 1. PURPOSE-These instructions are intended to show you how to install a Heavy-Duty residential garage door in a prepared opening. Since the installation of this garage door requires advanced mechanical skills, we urge you to read the complete installation manual before beginning the installation process. If you have any concerns about your ability to properly install this door after you read the instructions, we urge you to consult a professional installer in your area. NOTE: All instructions are given from the point of view of someone inside looking out. 2. GETTING STARTED-Since the right tools and supplies are essential for a safe and easy installment, we have provided a list of basic tools that will be required for installing this product. Tools marked with an (*) asterisk will greatly improve the installation process. CHECKING THE MATERIALS-Using the lists following, verify that you have the materials needed for this installation and that there is no damage to anything from packing, shipping, etc. If by chance you find any damaged or missing item's, please contact your authorized dealer and the problem will be resolved. NOTE: Several items are in opposite-handed pairs, and may or may not be marked by LH or RH. Hinges and track brackets should be stamped with a number with the smaller being mounted lower on the door. Strut counts vary by door width, height, material, gauge and track. Door sections, one with bottom weatherstrip. Your hardware carton should include the following. *Items are used with manually operated doors only. They are not supplied and should not be used with a door opener. *A stile is a vertical structure on the back of all sections that everything, even the face of the door attaches to. 3. CHECKING THE OPENING-Check the wood framing for firmness, especially the center pad that holds the spring's main bracket. This short piece of wood (15" min.) holds the entire force of the spring as it balances the door 's weight and tries to twist out from the wall at the bottom, and into the wall at the top. Being short, it tends to split readily so at this time we recommend you to lag (4-3" lag screws), nail (6-16 pd. nails), or anchor (4-3" sleeve anchors) it to the wall. NOTE: Always pre-drill holes so you won't split the wood. If by chance you happen to split the wood, immediately replace it with a quality wood. Measure the garage opening. The height and width should not be appreciably different than the nominal door size. If it measures low, then the door pattern may be obscured by the framing. If high or wide, then build the opening in with appropriate material. If narrow, you run a risk of not having enough wood to fasten the track brackets to. 4. SETTING THE STOP-Tack the stop to each side jamb and the header, flush with the inside edge of the jamb and header. This will prevent the sections from falling through the opening when you start stacking the sections. 5. BUILDING THE SECTION-On this and the following pages you will build the section from the bottom to the top. This will enable you to stack the finished sections in the opening in the correct order, from the bottom to the top. Lay the sections face down on a pair of sawhorses (or clean floor) with the upper edges away from you, top section first (on the bottom of the stack) staggering or stepping them toward you. The bottom section has a vinyl seal on it's lower edge, so use this to determine the top and bottom edges of the sections when stacking them. Now that you have the sections in place, you are ready to lay out the hardware on the sections. First, remove everything from the hardware carton except the cable drums, bearing plates, track brackets, and the track flag brackets. These will be used in the installation later. NOTE: All hardware in attached to the door sections with 3/4" sheet metal lag screws. They require a 3/16" or 5/32" pre-drilled hold as they are not self-drilling. The majority of these holes should be already drilled from the factory. Looking down on stacked sections. 6. BOTTOM SECTION-First attach the bottom fixtures even with the bottom corners of the door section. Next, attach the #1 hinges through the pre -drilled holes at the top of all the stiles. If you have two or more struts, attach one as low on the section as possible, but above the rollers, using 2 lags per stile. Next, slip the looped cable ends onto their studs on the bottom fixtures. Roll the excess cable and tuck in under a stile for now. Next, cut the vinyl bottom seal to the length of the section leaving an additional 1/2" on each end. Next, put a roller at each corner of the section, 2 for the hinges and 2 for the bottom fixtures. 7. SECTION #2-Attach the #2 hinge through the pre-drilled holes at the top of both of the end stiles. Next, attach #1 hinges on the center and intermediate stiles the same way. If you have 3 or more struts attach one just below the hinges using the above instructions. Next, put a roller into each end hinge. 8. SECTION #3-Attach #3 hinges through the pre-drilled holes at the top of both of the end stiles. Attach #1 hinges on the center and intermediate stiles the same way. If you have four struts, attach one just below the hinges using 2 lags per stile. 9. TOP SECTION-If the door has only one strut, attach it across the top edge of the stiles using the above instructions. Next, locate the top edge of the adjustable top fixture 3-1/4" to 3-1/2" down from the top edge of the end stile and fast. Insert a roller into each fixture. 10. LOCK-Since this is to be a manually operated door, first decide which end of the door is more accessible to you when entering the garage from the house (usually better if it's the right side) and put the lock there. Lag the snap latch exactly midway up the end stile of the second section, pointed end out, and with the body of the latch flush with the end of the panel. Drill a 1/4" pilot hole clear through the next stile out from that end of the door section, through the outside sheet metal. Drill this out to 7/8" (exactly), and mount the lock handle from outside with the screws provided. The flange on this locking handle should be horizontal, not vertical. If you tighten a screw too far and it doesn't hold, back up with the spring steel keeper provided. Turn the handle to the horizontal position and lock it. From the inside, mount the inside plate over the square handle stem that protrudes in. Turn this inner handle clockwise as far as it will go. If you are on the right end of the door, crimp the latch cable through the upper handle hole. If on the left end, use the lower hole. Crimp the other end of the cable to the snap latch hole, keeping the cable fairly tight and trim off the excess cable. Crimp the aluminum oval with a pair of vise grips. 11. SHAFT ASSEMBLY-From the hardware carton remove the cable drums, and the center bearing plate. Start the set screws into the cable drums and springs. The drums are marked LH and RH. In order, slide the LH drum onto the tubular shaft, then the right wound spring, the center bearing plate , the left would spring and the RH drum. It is possible you may only have one spring. The drum's set screws should face inward toward the set screws in the winding cones on the ends of the springs. Bolt the springs together through the hole in the bearing plate with 3/8" bolts. Check that the diagonal corner will be down when the assembly is over the door. Attach the spring caution tag to one of the 3/8" bolts. Hand tighten the set screws to the shaft so the springs cannot slide on the shaft. 12. TRACK ASSEMBLY-Separate the track bundles. The two curved pieces are the left and right horizontals, the two straight ones are identical and make up the left and right vertical assemblies. NOTE: -While assembling, keep all nuts and bolts loose. To make the vertical assembly attach the #5 track bracket to the lowest slotted hole set and the #6 track bracket to the middle slotted hole set. For now the upper slotted hole set is ignored. Next, attach the flag bracket through it's lower slot to the TOP most two holes in the track. The flanges of these three brackets should extend outward away from the door and not inward behind the track. The inside cup of the track should open inward toward the door. Assemble the vertical for the other side of the door so that when finished the two are mirror images of each other. Attach the horizontals to the verticals. Connect the horizontal to the flag bracket with one 3/8" bolt. Align the horizontal and vertical sections at the flag bracket and attach the horizontal to the upper slot in the flag bracket. When tight the horizontal and vertical sections should be a square. Next, attach the end bearing plate to the horizontal track so when attached the flange is even with the flag bracket and pointing away from the door. Tighten accordingly. Repeat for other side. When finished they should be mirror images of one another. 13. STACKING THE DOOR-Center the bottom section in the garage opening and hold the section in place with nails driven into the jamb and bent over against the section. Next, using a level, shim the panel at one end until dead level. Place each section in the opening on top of the previous section checking and adjusting for level each time. Finally, affix hinges and rollers to each succeeding section. You should now have the complete door in the opening with all rollers in place. It should look exactly like this. NOTE:-Before tracking the door we recommend you get another person to help you as this can be very difficult and possibly dangerous if done incorrectly. 14. TRACKING THE DOOR-First, straighten all rollers and drape the cables up behind them to get the cable out of the way. Work the right track assembly around the rollers. Using 5/16" x 1-1/2" lags, mark, pre-drill, and attach the track brackets to the wall. The track should be vertical with 1/2" clearance between it's inner edge and the door all the way up. With the track secured, lag down the flap bracket with three lags, keeping it vertical. Pull out the nails holding that side of the door up and move this side of the track forward or backward (remembering the adjustable slotted holes on the track brackets) until you have about 1/2" clearance between the face of the door and the jamb. Tighten all the track bolts. Repeat this for the left side of the door. 15. SPRING MOUNTING-Place the stepladder at the center of the door. Center the springs on the shaft assembly, making sure to set at least one set screw so that it won't slide. Standing at the base of the ladder, place one end of the shaft on the horizontal track at the end bearing plate and climb the ladder. Place the end of the shaft into the end bearing plate, sliding it until the other end of the shaft can be set into its bearing. NOTE:-If there is not enough clearance you may have to cut a few (no more than 5) inches off the shaft. With the shaft entered (equal amounts of shaft left out of the end bearings), raise the springs until the shaft is level and mark the holes of the center plates flange onto the wood center pad. NOTE:-If you plan to install a garage door opener in the future, offset the center flange so the base of the opener can be mounted. Pre-drill two 1/4" holes. Fasten the center bearing plate to the spring pad with 5/16" x 2-1/2" lags. 16. SETTING THE CABLES AND DRUMS-Set the LH drum tight against the bearing and tighten the two set screws. Bring the cable up to the drum, checking for a straight run from the bottom fixture with no interference. Set the bottom end of the cable into the slot on the drum. Turn the drum, top toward you and down, and keep the cable firmly in the groove that starts at the slot until the cable is tight enough to strum. 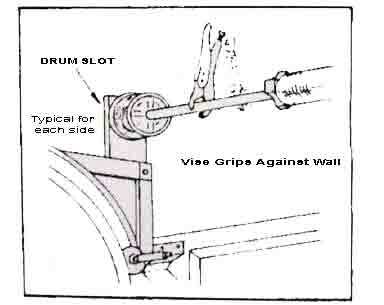 Use vise grips on the shaft, wedging their end against the wall or the ceiling to hold the cable, drum and shaft tight. Put the right hand cable in the RH drum, turning it on the shaft as before to tension the cable , then tighten the set screws. 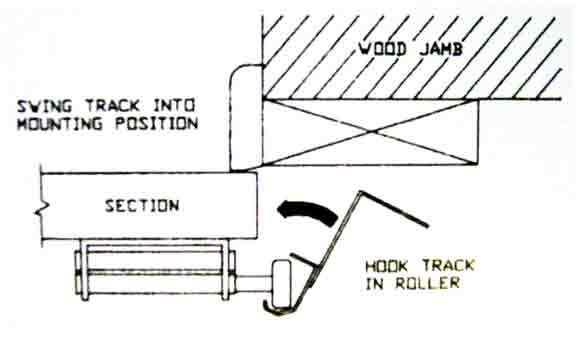 The rolling action of the set screws on this drum lends to tighten the drum further, so "pluck" both cables when you are finished to see if they are about the same tension. If the tension is OK and the door still sets level you may go on to the next step. If not, re-adjust the RH drum until they are close in adjustment. 17. WINDING THE SPRINGS-The holes on the winding end of the spring have been drilled for 1/2" diameter cold rolled steel 15" winding bars (not included). 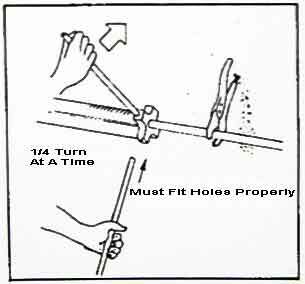 Never use vise grips, pipe wrenches, socket extensions, screwdrivers, rebar, or anything else to wind the springs except the proper winding bars. They should be dressed fully into any of the holes on the spring end. Stand on the ladder off to the side of the springs so that if a bar slips or a casting breaks, the spinning spring won't fling the bar into you. Never stand in front of the springs when winding. Wind the springs up. It will seem that you are trying to screw the cast end out of the spring, but it only gets tighter. You wind by inserting a bar into a hole on the casting and cranking the spring out and up. Count the turns according to the following guide. While firmly holding the winding bar, turn down the set screws until they contact the shaft, and then 1-1/2 to 2 turns more. Do not touch ANY set screw on a spring without a winding bar firmly in place. Remove the vise grips and wind the other spring the same amount. If the door seems unduly springy or "fast," ease off on the stronger spring as much as one full turn. The door should rise smoothly without flying up or without setting on the floor. 18. TRACK BACK-HANGS-Gently allow the door to open half way, making sure your horizontal tracks are not too wide, or the door will fall out of the tracks. Center the door in the opening and use your hammer to straighten the horizontal tracks by rapping them at each roller, and recheck centering, keeping in mind that the track should rise from 1/2" to 1-1/2" at the rear. Measure the drop from the ceiling and cut the perforated angle accordingly. The drops should be straight and plumb, both front to back and side to side so you will probably have to drill a hole in the track somewhere other than the very end. Use the 5/16" bolts for the back hangs, and when done put one more bolt through the last hole in the track, pointing inside this time to stop the top roller from rolling out the track should the door be opened too hard. Mount a diagonal kicker made from perforated angle to the back hangs at a 30 to 45 degree angle to the inside of the track. A finished ceiling will call for a piece of angle fastened to the hidden joists through the sheet rock, and as before, it is essential that you pre-drill all lag holes to avoid splitting the hidden wood in this critical area. Use a 5/16" x 2-1/2" lag screw when applying angle to sheet rock. 19. FINAL DOOR CHECK-Run the door up and down several times, slowly as well as quickly to test for smoothness and quietness. If you have the poly rollers, don't lubricate the track. If you have the steel rollers, lightly lubricate the track and the roller bearings with an oil (never a grease) every six months. After the door installation is complete, adjust the stop to the door in the closed position by placing the stop flush against the door and lightly push on the door to make sure the pressure from the stop will not hinder the door's movement. Nail the stop to the jamb with galvanized nails, every 12". Drill two holes through the face of the door and mount the two grab handles back to back, one inside and one outside. Bolt the strike plate to the track with track bolts. Remove this piece if you later motorize the door. Adjust the clearance of the latch and plate by moving the vertical track in or out at the center track bracket so they engage and disengage smoothly (Refer to Step #10 for location).